Bitter gourd omelettes are comfort meals that a lot of us grew up on. In this traditional Chinese favourite, soft and crunchy bitter gourd slices are nestled in a tender and fluffy omelette that’s lightly flavoured with pinches of everyday spices like salt and white pepper, and dashes of flavourful Asian seasonings like sesame oil, light soy sauce and sometimes, with Chinese wine. In my family, it was my mother’s way of introducing bitter gourd to me and my siblings, and it worked with most of us, save the girls. My sister and I mostly nibbled the fluffy omelette around the bitter gourd slices, to the chagrin of Mom and the boys! Though it took me almost 30-odd years to come around to appreciating the bitterest of all vegetables (it is an acquired taste for most of us), I’m now so completely hooked on bitter gourd because it really is such a healthy and nutritious fruit (yes, you read it right, the bitter gourd is more a fruit than a vegetable). As there isn’t much flavour to be expected from bitter gourd (but we’re eating it for it’s wholesome goodness and nutritiousness), I feel it’s so important to flavour the beaten eggs. With just a sprinkling of salt and white pepper, and dashes of sesame oil and light soy sauce added to beaten eggs, this becomes a good, flavourful omelette base. It’s simple enough, and yet, incredibly tasty and versatile when it comes to cooking Chinese style omelettes (egg foo young) with other vegetables such as sliced spring onions, mushrooms, carrots, or with cooked meats and seafood like roast pork (char siew), minced pork or chicken, shrimp and crab meat. Do you enjoy a meatier bitter gourd dish? 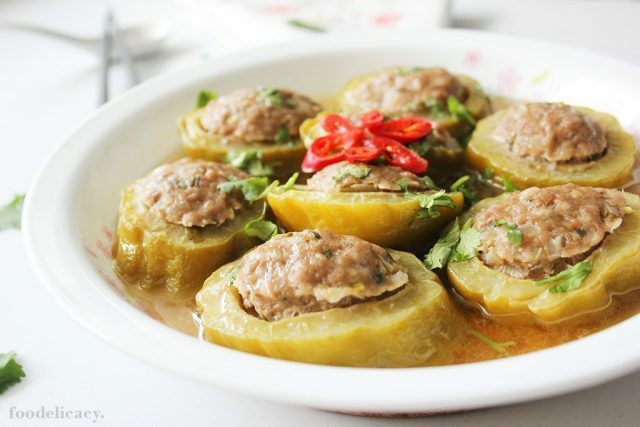 Try out this healthy dish of bitter gourd stuffed with minced pork – it’s an ever-popular, classic Chinese-style bitter gourd dish of bitter gourd slices stuffed with minced pork, and steamed till bitter gourd is soft, meat is tender, moist and juicy, in a delicious, flavourful soupy broth of cooked juices. The result – a bitter-less, wonderfully tasty one dish-meal! 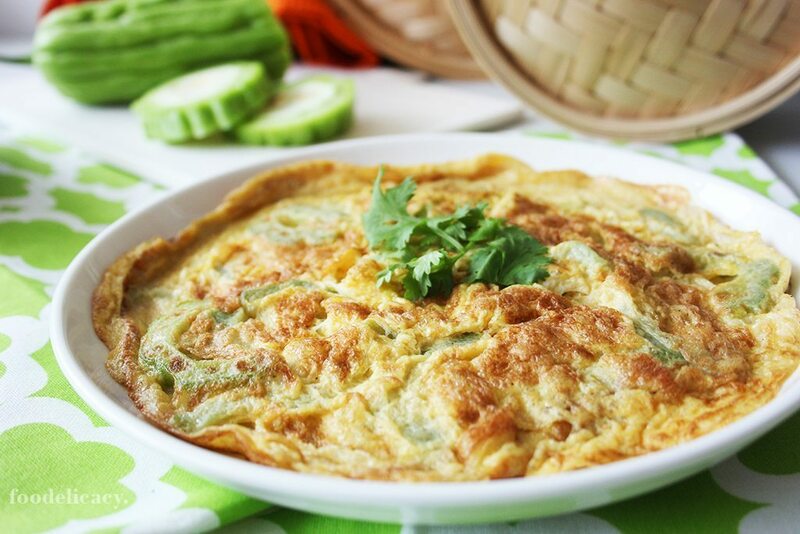 The other way to enjoy this vegetable is a typical Cantonese-style preparation of bitter gourd omelette, where bitter gourd dominates the dish (so it’s more of a vegetable dish), and the eggs are lightly scrambled till just almost cooked. The heat is then turned off so that the scrambled eggs stay a little moist and mushy. 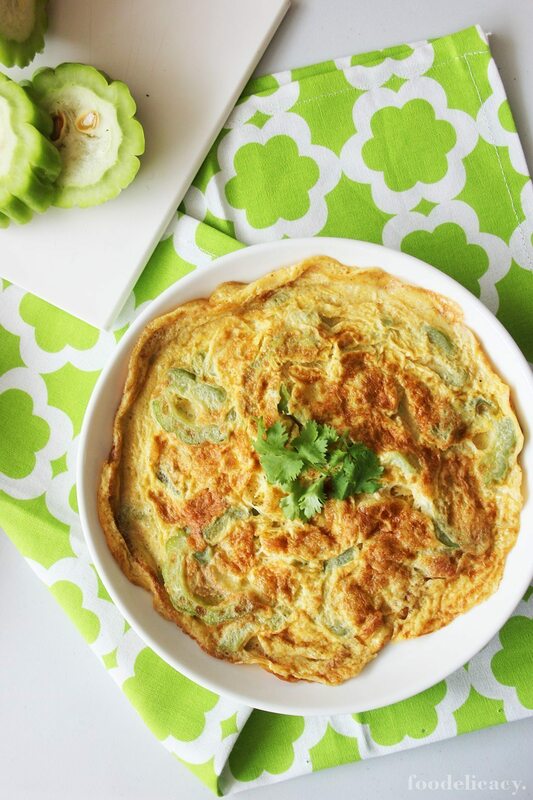 This version of bitter gourd omelette allows the beaten eggs to set and brown nicely as it cooks, retaining its light and fluffy texture (just try not to press down on the omelette as it cooks). It’s so deliciously homey, and makes for a quick, nutritious meal with steamed rice! 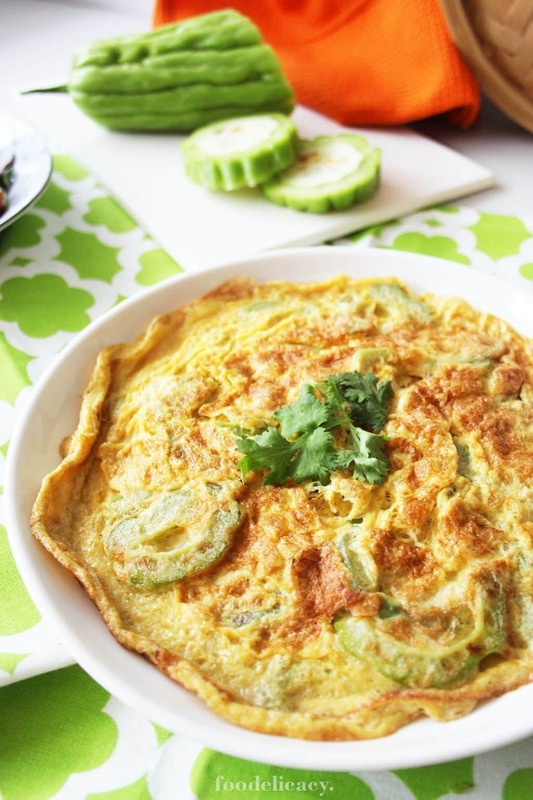 Makes a tender, fluffy and flavourful bitter gourd omelette that's lightly flavoured with pinches of everyday spices like salt and white pepper, and dashes of flavourful Asian seasonings like sesame oil, light soy sauce. Cut off a one-third length section of a medium-sized bitter gourd (or roughly 100 gm) and cut in half, length-wise. Scrape out the seeds using a spoon. Slice into 5-mm slices. Place in a mixing bowl. To reduce bitterness, sprinkle some salt. Rub salt into the slices, or toss several times to mix in evenly. Set aside for 10 minutes. Rinse slices under running water to rid of excess salt. Drain and set aside. In a clean mixing bowl, combine light soy sauce, sesame oil, salt and white pepper. Stir with a spoon until well mixed. Break in the eggs. Lightly beat with a fork or whisk, until the eggs and seasonings are well combined. Heat up a wok over high heat until hot. Add 1 tbsp oil. Stir fry bitter gourd slices until softened, about 1 minute, or when bitter gourd turns slightly translucent. Spread out the slices evenly, then drizzle all over with the remaining 1 tbsp of oil. Beat or whisk the egg mixture one more time (to incorporate more air), then pour over slices, covering the edges and centre evenly. Once the edges of the omelette start to set, reduce to medium heat. (do not press down on the omelette as it cooks). Once the underside of the omelette has set firmly enough, flip over and let omelette cook through. Turn out onto a serving plate. Garnish with some Chinese coriander, and serve immediately.